I visited 2 mosques on the same day. Now is that a record breaking feat? I think so. For me at least. Lol. And to all non-Muslims who think they are not allowed to step into a mosque in Malaysia, well, it's simply not true. You can certainly visit a mosque as long as you dress decently and it's not during prayer times. 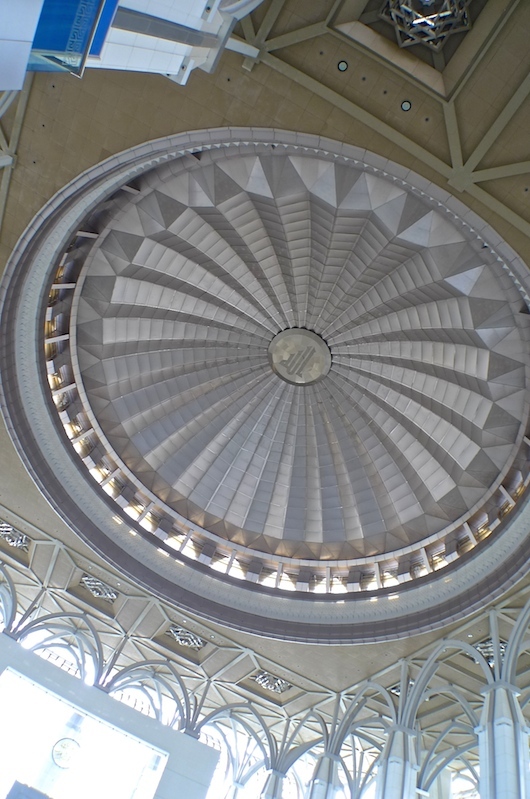 Anyway to recap, my day in Putrajaya started with a visit to the Putra Mosque with my friend. Then I brought him to see the PICC building and the incomplete Putrajaya Monorail Suspension Bridge. Right after that, we went to our second mosque of the day - the Iron Mosque. That's a photo of the Iron Mosque which I took from the Putrajaya Lake. Yes, we were on a boat cruise (which I will blog about next) and the view of the mosque looked better from the lake. 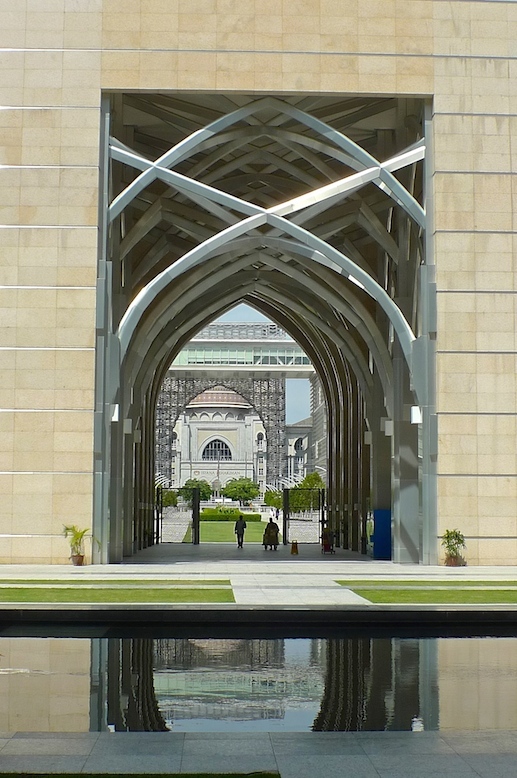 Located at Precinct 3 next to Millennium Monument and opposite the Palace of Justice, the Iron Mosque is the second principal mosque in Putrajaya, after Putra Mosque. Despite that, the Iron Mosque's area is twice that of Putra Mosque. Officially, the mosque is known as Tuanku Mizan Zainal Abidin Mosque, named after the 13th Yang DiPertuan Agong (King of Malaysia). However, it's popularly known as Iron Mosque (or Masjid Besi in Malay language) because it's made up of mostly steel (70% iron, 30% concrete) and it looks like a stainless steel structure from afar. This mosque is very unique. Firstly, there is no minaret, which is used for a call to prayer and which can be found in most, if not all mosques in Malaysia. 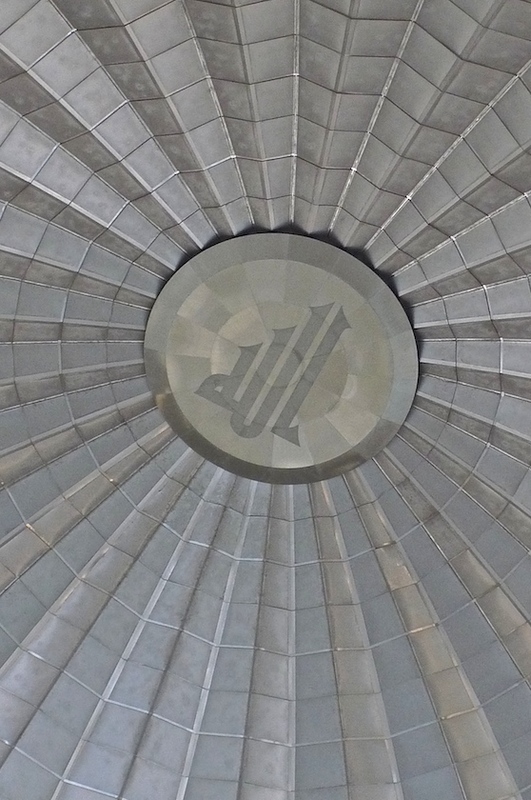 The mosque employs 'architectural wire mesh' imported from Germany and China. 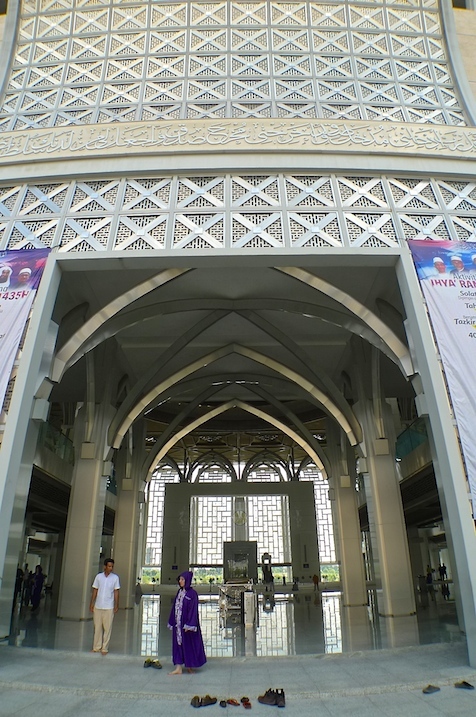 The main entrance is strengthened with glass reinforced concrete to increase the integrity of the structure and the crystal glass creates an illusion of a white mosque from the distance. A couple of shots of the main entrance. A tour guide greeted us when we stepped into the mosque. Inside, we were stunned to see that the mosque is actually surrounded by an infinity pool! Amazing. I could see three bridges from here! If you have read my posts on the Bridges Of Putrajaya, can you identify these three bridges? The guide brought us to the prayer hall which is under a large dome. He asked us if we recognise the word at the highest point of the dome. So we looked up. The word was written in Arabic. We do not know how to read Arabic but we could guess. The word "Allah" was inscribed there. Allah is what Muslims regard as God or the Almighty. Actually, I was feeling a little uncomfortable with this guide as he was too forceful in pushing the Islam religion down our throats. Hey, we were just there to see the mosque like a tourist and maybe learn a thing or two about Islam, but we were certainly not there to be converted! The guide made me wanted to leave, which was unfortunate (he should have followed the example of the friendly guide at Putra Mosque). I could have spent more time and learnt more things. I actually did not take a photo of the glass Mihrab wall that has verses on it. This special glass does not reflect light, thus making the verses appear as if they are floating in the air! Oh well, maybe next time if I get the chance to visit this mosque again I will take a picture of that! More photos of the infinity pool surrounding the mosque. That tall pillar in front of the bridge is the Millennium Monument, a national monument in Putrajaya. And that pink dome shaped building on the right is the Putra Mosque, which we visited earlier. We also went downstairs to visit the area where Muslims perform their washing ritual before prayer. A wide corridor with shoe shelves on both sides. We then went back up and I took another shot of the infinity pool. Ah, this picture is clearer. Now can you see the bridge (Seri Wawasan bridge), the Millennium Monument and the Putra Mosque with its minaret? Nice covered walkway outside the main entrance. I thought this makes a pretty cool image. Despite not very happy with the guide, I enjoyed my visit to this Iron Mosque and certainly recommend anyone to visit it.